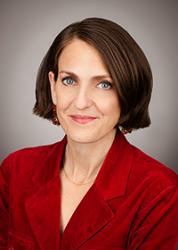 Reducing Unnecessary Occupational Licensing Requirements. 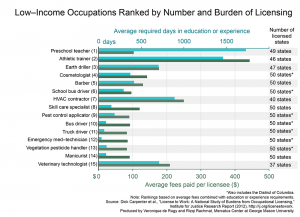 The Budget seeks to reduce occupational licensing barriers that keep people from doing the jobs they have the skills to do by putting in place unnecessary training and high fees. The Budget proposes a $15 million increase for grants to States and partnerships of States for the purpose of identifying, exploring, and addressing areas where occupational licensing requirements create an unnecessary barrier to labor market entry or labor mobility and where interstate portability of licenses can support economic growth and improve economic opportunity, particularly for dislocated workers, transitioning service members, veterans, and military spouses. In other words, the administration understands how destructive occupational licensing laws are — that’s great news. Licensing laws have transformed from an arguably reasonable way to protect consumers into powerful tool to limit innovation, competition, and upward mobility. They’ve grown dramatically: In the 1950s, one out of every 20 workers was required to obtain a government license; today, an astounding one out of every three U.S. workers needs government permission to work. 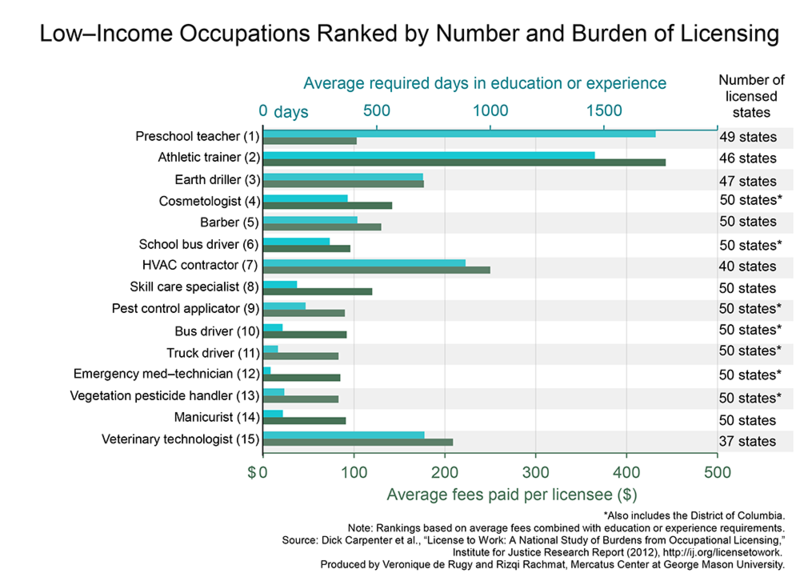 As I have said in the past, many of the licensed occupations have traditionally provided low-income Americans with a path to self-sufficiency and upward mobility. By erecting barriers to entry to these occupations, we erect barriers to entry to the American dream. 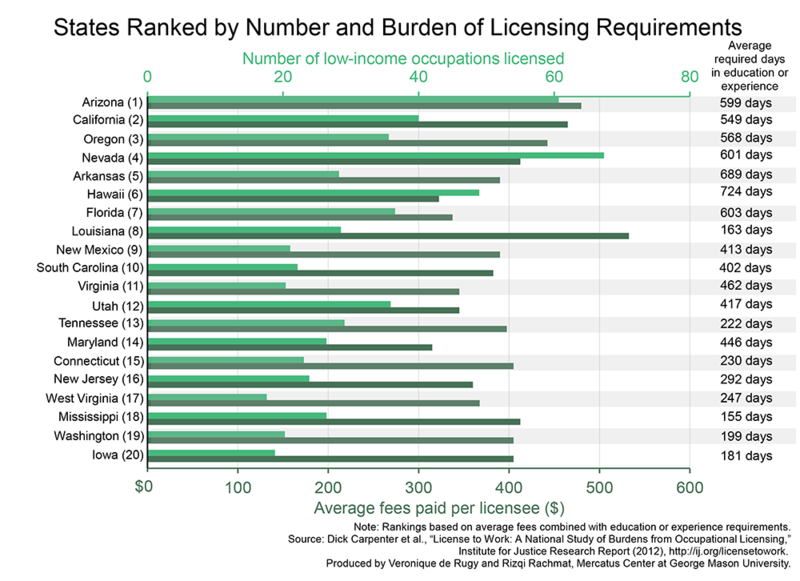 Two charts from the Institute for Justice show how burdensome these regulations can be. 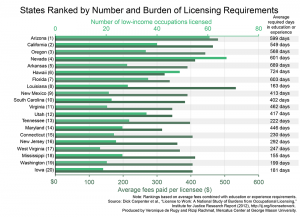 The think tank did the first holistic look at the burdens and breadth of licensing laws that target 102 low- to moderate-income occupations in all 50 states and the District of Columbia. Whether the president’s $15 million will move us closer to states getting rid of these laws, I don’t know. Certainly, it’s up to states to repeal their own licensing laws, which will require people taking on special interests. But I do welcome the attention it will draw to the issue.